Pastor Stone is founder of the “Power of God Ministries” and the “Flint International Dream Center” along with his wife Sharon. The ministry is in its 8th year as of 2008 and has taken on tremendous growth. 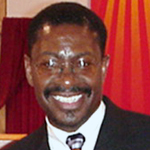 Pastor Stone has been involved in ministry for over 30 years, operating in many different capacities: member, Sunday school teacher, Sunday school Superintendent, Trustee, Deacon, Choir, Church Administrator, Minister, Elder, District Superintendent (2yrs), and Pastor of his great assignment…the “Power of God Ministries”. Pastor Stone is very committed to community outreach, which led him to establish the “Flint International Dream Center” which focuses totally on outreach. Pastor Stone has established an annual Easter and Christmas program that gives away tons of food, hundreds of bicycles and thousands of toys. In addition, Pastor Stone has established a yearly three day event called “Global Street Conference Festival” that has brought thousands from the community, state and across the country. This conference has brought in some very renowned kingdom builders as well as been a tremendous blessing to the community through food-giveaways, back to school supplies and phenomenal musical extravaganzas. Pastor Stone is married to Evangelist Sharon Stone and has three sons, LaMarcus, Shawn and Galen. Flint International Dream Center, Flint Mich.
Executive Director: Responsible for the daily operations of a nonprofit outreach ministry. Established and started an outreach ministry that has been a leader in the community in giving away food (over 600,000lbs), free clothing weekly and putting on events annually such as Global Street Conference Festival (3 day event that attracts thousands that motivate those less fortunate to build their skills to become viable and employable in society), Christmas, Easter and Thanksgiving events that impact meeting the needs of those in the community that are less fortunate. Staff Quality System Administrator: Responsible for the coordination, implementation and managing of TS 16949, QS 9000 Quality Systems and ISO 14000 Environmental System. Responsible for the coordination and managing of the plant “GM / UAW joint leadership process. Responsible for overseeing the plant “GM / UAW” joint training programs. Accomplishment:	President’s Council Honors for meeting GM Sector Business Objectives. Area Manager: Responsible for Mfg. Operations of V6 4.3 engine assembly line & machine floors. Responsible for managing over 400 personnel both hourly and salary. Responsible for overseeing a 4 million dollar annual department budget and assets valued over 25 million dollars. Eastern Michigan University, Ypsilanti Mich.
Spring Arbor College, Spring Arbor Mich.
Mott Community College, Flint Mich. Associate Applied Sciences Degree - with emphasis in Production Operational Mgmt.